26 pages were found with this tag. In this episode, Ricardo explains how to read the PMBOK® Guide 6th edition in a more productive way, so you can better understand the project management knowledge areas and their processes. Many people believe that the Guide should be read as a traditional book, from the first to the last chapter, but by listening to this episode you will discover that this is not the best way. Watch the video and download all resources related to the A Guide to the Project Management Body of Knowledge (PMBOK® Guide) — Sixth Edition processes flow. Backstage photos of the recording of the video of the PMBOK® 6th Edition Process Flow. 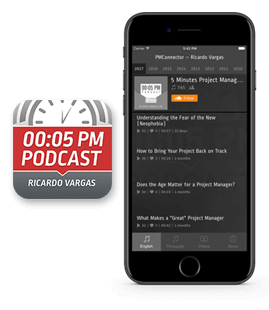 In this episode, Ricardo talks about two terms that appear very often throughout the PMBOK® Guide and usually generate a lot of questions from those who are starting in project management. In this podcast, Ricardo concludes the series of five podcasts on the PMBOK® Guide 5th Edition. He talks about the reasons behind the creation of processes "5.1", "6.1" and "7.1", Plan Scope Management, Plan Schedule Management and Plan Cost Management, respectively. He comments on how best to use these processes, taking into account the project complexity.